I recently had a conversation with a friend about the importance of concentration. While I know so well the importance, I struggled with verbalizing it in a way that satisfied me so I decided to refresh my memory by writing a post. I have chosen to use the words of Maria Montessori and Mihaly Csikzentmihaly with a few additions from me. Researcher Mihaly Csikzentmihaly has found concentration to be one of the characteristics of life’s most meaningful and satisfying moments (flow). Why is it important for the child to concentrate? He had been working on these nesting bowls for a while and was concentrating so deeply that I wanted to capture it. Somewhere along the line, he started smile and looked so happy! When I saw this quote, it made sense. How can we help the child concentrate? 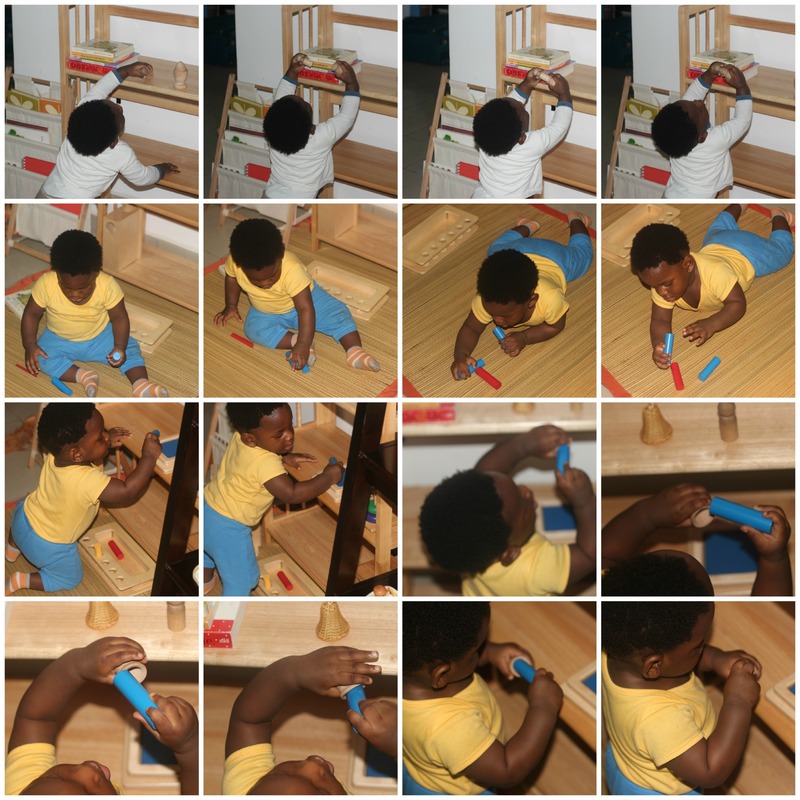 I LOVE the Montessori philosophy and the opportunities the environment provides the child! Another characteristic proposed by Csikzentmihaly is that the challenge is matched to skill. The skill should be stretched to it’s limit to meet the challenging goal. Again, I see a parallel to Montessori’s words. 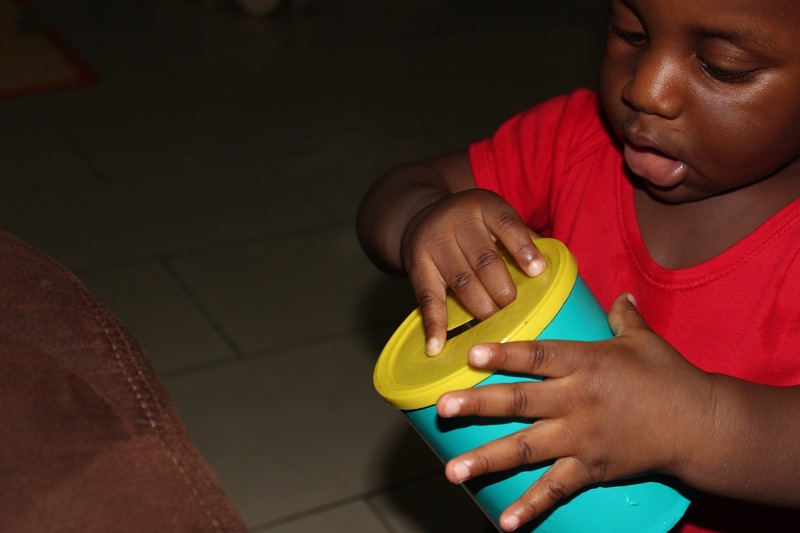 The objects have to continue to progress to continue to challenge the child and help him continue developing. What does concentration look like? I really like this quote. 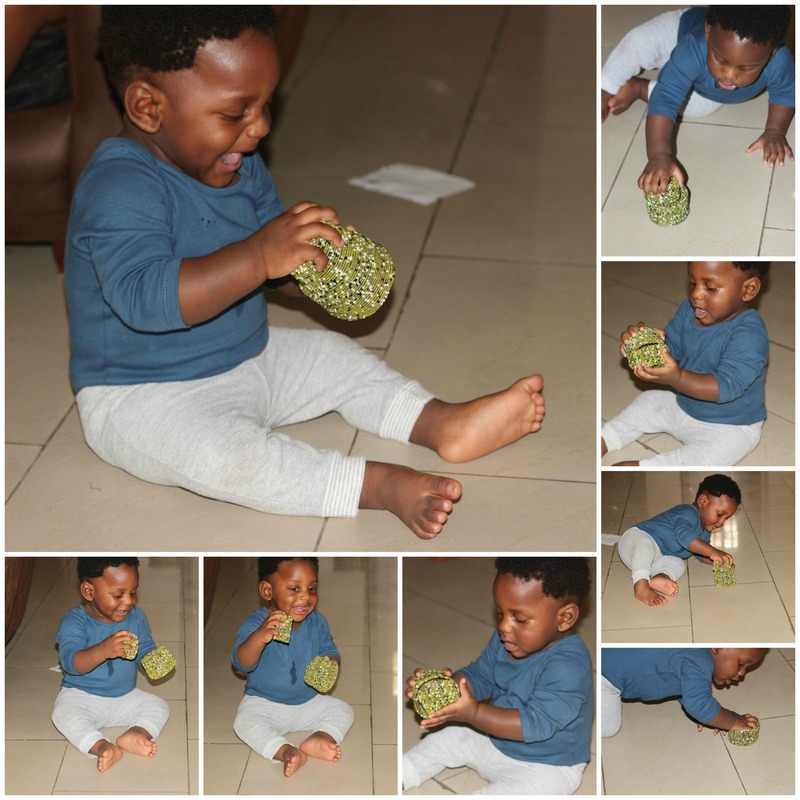 My son is always occupied but not always concentrating, You can see the difference, the intense focus that one activity that engages him entirely for some time. Battery operated toys that have buttons for the child to press, may occupy the child but they rarely, if ever, lead to concentration. When you have observed of worked with older children in a Montessori classroom or have observed a child watching a Mobile, you have the impression that concentration looks like at least 30 minutes of intense focus. A long process with lots of repetition. Even if you have not observed a class, as adults we associate concentration with sitting still. And then you observe your infant or toddler and wonder why they do not concentrate but don’t they? No one says it must fix in the same way. My son concentrates. It looks completely different from my expectations of concentration but once you put aside your preconceived notions, you see it. He was so focused! Even as he moved around, he never lost focus. I have so many pictures of his focusing/concentrating on different activities and they all have one thing in common, he keeps changing position. He chooses an object… usually one he is still struggling with. He may start out standing, and then he sits, he may even then lie down, and roll over, kneel down, and turn this way and then that way… all the time trying to figure it out and then repeating and repeating. Concentration. Then he’s done! he drops it and happily moves on to the next thing. It might have been 20 minutes or only 10 or 5 or even 2 but in those two minutes, he concentrated, he was in control of his world, he was experiencing flow, organizing his psychic life and building character! Concentration helps build character, causes happiness and leads to learning. Please contribute to the conversation. Deeply reflective and great quotes! I really like this one “concentration engages the child’s whole personality” as an indicator of what to look for. I think you stated it but I really wanted to emphasize how important it is for the adult to NOT INTERRRUPT once concentration has begun. You covered some great outcomes when a child is concentrated so we as the adults need to ensure our actions are fully supporting the child’s development to reach this outcome. Thank you montessoricarrie! There was a quote about not interrupting but of course it helps to hear it again and again. Thank you for the emphasis. I also wrote a follow up post that emphasizes this even more. I hope you’ll add any thoughts to that post. Thanks for stopping by! I’m reading your posts as O. naps … thanks for your very important reminders. I often feel as though I provide plenty of space and opportunity for O. to concentrate, but I know I must do better, by turning off the ever-droning radio (I’m an NPR addict) and providing more interesting work/materials for O. You have done so much to provide an enticing environment for your son, and you are an excellent observer! Now that O. is 18 months, I want to more astutely observe his interests and aid his already good capacity for concentration. Thank you! Than you for your comment dgvarney. I think the most important thing is to constantly strive to do better. I am working on remembering that even taking pictures can be distraction so I’m there with you!